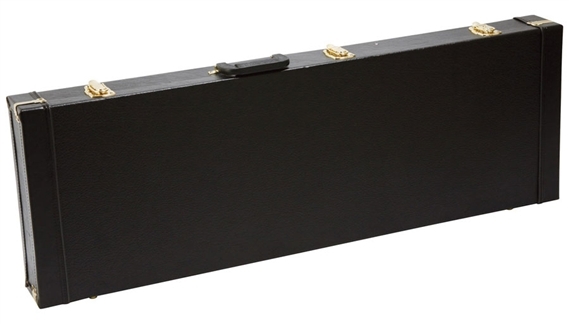 Shop On Stage GCE-6000B Electric Guitar Hard Case from AMS and enjoy Fast & Free Shipping. On Stage GCE-6000B Electric Guitar Hard Case is constructed from quality plywood material, perfect for protecting and transporting your guitar. The custom-molded interior safely holds most popular name brand electric guitars and provided full neck support. Final touches include an interior soft plush lining, solid brass latches, hinges and feet, and reinforced piping on all edges. 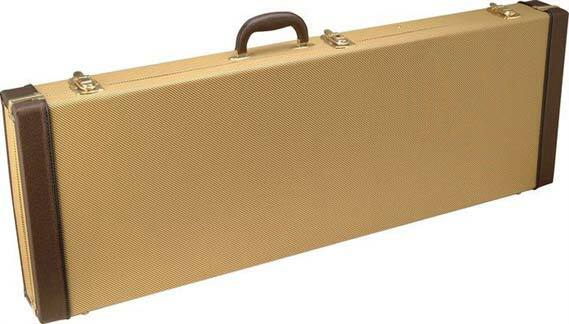 You're not getting a Fender tweed case, so keep that expectation at bay. It's more of a textured covering than an actual tweed feel, but it looks great and does its job. Great case for the price! Looks like the fender one but with a smaller price tag! The good : Nice case fits my strat style guitar like a glove. Looks and feels to be made of good quality materials and hardware . lightweight and durable . has a large storage compartment for cords and Turner, picks & extra strings etc. The bad : Case arrived in good shape However there are some gaps in the seams when closed. I ordered the tweed the color is more yellowish and a hint of green . its not to bad as its only a case but not what i expected for a "tweed" . The interior is padded and feels soft but kinda thin and cheap feeling but so far it's doing the intended job . I am giving it 4 stars mainly for the gaps in the seams when closed and not lining up / seating correctly which makes the latching and unlatching difficult at times with one hand. Overall it's a decent case and would probably buy again if on a budget . My Tele slides a little in it, and the lock on the right sticks, so you have to use two hands to open it. It looks unique, but more like Pig Skin that snake skin. It works fine for me. Well made at almost half the price of the other ones. GOOD CASE FOR THIS PRICE ESPECIALLY!!! I'M SAYING WHAT OTHER REVIEWERS ARE SAYING. THIS IS A GOOD CASE FOR THE MONEY. GOT THE TWEED ONE AND IT LOOKS GREAT. LARGE STORAGE COMPARTMENT IS NICE. PERFECT FOR STORAGE AND GENERAL USE. I DON'T SEE ANY OTHER CASES THIS PRICE. IF YOU JUST NEED A SIMPLE CASE - THIS GETS THE JOB DONE. AMS GETS THE JOB DONE TOO - AS USUAL. LOVE IT !!!!!!!!!!!!! Pretty solid for the price and does the job. Decent enough case for general use. Not really made for air travel or touring but for most situations adequate. It's a decent guitar case for general use and storage. I wouldn't take this on a world tour, but I don't really have to worry about that. The tweed covering is really nice and the build is plenty sturdy for most folks. The case is pretty good quality wise. Not a Fender but still a good deal. The fit and finish is clean and it seems sturdy enough. My tele fits good and there is a very large storage area for the extras you will want to carry. Very nice value.